A name change is being cooked up for Charleroi. Beginning May 16, the Washington County town is going to be named for probably its best-known product: Pyrex. “For 100 days, we’ll be putting up signs saying, ‘Welcome to Pyrex, Pa.’ or changing the name of events to things like the Pyrex Baseball Tournament,” says Mike Scheffki, brand manager of Pyrex, the ovenware manufactured there. It is part of the centennial celebration for Pyrex, the heatproof ovenware Scheffki estimates is in 80 million homes in North America. Editor’s note: A reader sent in this request – if you are interested, contact Rick. I’m trying to start an entrepreneur meet up in the Charleroi, PA area. Looking for people interested in joining me. I can be contacted at 724-992-8695. Donn Henderson sees the Charleroi riverfront development he wants 25 miles away in Pittsburgh. Re-creating Pittsburgh’s successes deep in Washington County‘s Mon Valley will not be easy. But continuing to watch the once-thriving industrial and retail community lose population amid growing drug and crime problems certainly will accomplish nothing, Henderson said. “We cannot continue that trend and survive,” he said. Lue Ann Pawlick never envisioned companies connected with oil and gas beating a path to Alta Vista Business Park when it broke ground in tiny Fallowfield, Washington County, in 2001. Today, three of the five companies in Alta Vista work in the industry. An energy company is set to start construction in the spring, and at least one more is close to signing a deal to locate there. Ten years ago, Fort Worth-based Range Resources Corp. drilled the first Marcellus shale well in Washington County. 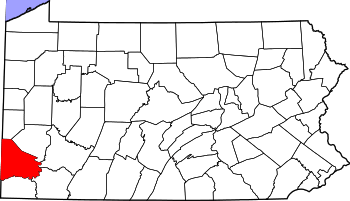 Now the county — which dubs itself “Energy Capital of the East” — is home to about 1,000 wells, the most in Pennsylvania. The Charleroi Regional Police Board on Wednesday terminated the employment of part-time police Officer Steve Kenyon, citing “conduct unbecoming an officer,” according to two board members. Acting upon the recommendation of its personnel committee, the board ousted Kenyon behind a 6-1 vote. Kenyon will receive a letter informing him of the decision. The board had removed Kenyon from the work schedule in May after his girlfriend was arrested and charged with possession of drug paraphernalia while parked in Kenyon’s private vehicle in Charleroi. Editor’s note: Is nothing sacred!!!!???? Two Charleroi Area School District cafeteria workers stole about $94,000 in a scheme that involved pocketing cafeteria money and using it to gamble at a casino, according to Washington County criminal complaints. Stacy Lee Shipley, 50, and Sheila Ann Cook, 49, both of Charleroi, went to The Meadows Racetrack and Casino with money that Ms. Shipley stole from the school cafeteria, the complaints say. Ms. Shipley would tell Ms. Cook that she had “extra money” with the understanding that the money was stolen. The pair promised each other they would split all winnings, according to the complaint. Ms. Cook told police that she “just got caught up in the thrill of it all.